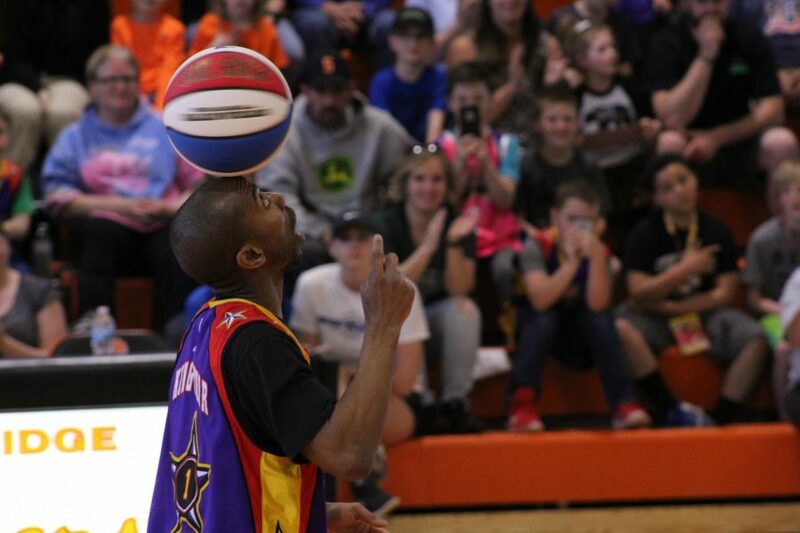 “King Arthur” Lewis Jr. a performer on the Harlem Wizards Showtime Unit, mesmerizes the crowd with his ball balancing skills between halves. On April 30, families in the community gathered in the new gymnasium to experience the one-of-a-kind show the world-famous Harlem Wizards put on. The Harlem Wizards, a group of basketball players who compete against school staff and travel cross country to perform at high schools for fundraising events, came to Stockbridge not only shoot hoops and alley-oops, but to also raise money for new weight room equipment. “We hope we can have another Harlem Wizards event in the future, possibly every other year,” athletic director Megan Kunzelman said. If the Wizards are able to come semi-annually, more of the raised money will be put toward the athletics programs according to Kunzelman. Children of all ages basked in the quirks and talents of the players as they incorporated interaction with the crowd into the game. From running into the stands to even taking people’s phones and taking pictures of themselves, the Harlem Wizards made sure the crowd was engaged. Junior high principal Joseph Wenzel took part in playing against the Wizards along with other staff members Jason Rickli, Darren Hejnal, Susan Lockhart and Jeffery Trapp.